The chart features some suspiciously familiar faces to anyone aware of the top grossing rankings as well. Clash of Clans takes the #1 seat overall as well as on Google Play, but is all the way down at 7th place on the App Store. It's also the highest grossing iOS title over the last nine years, and in good company in terms of revenue with games also on the session time list such as Candy Crush Saga. Apptopia's data does exclude third party Android stores in China and several other regions, however, which explains the absence of major players in Eastern markets. 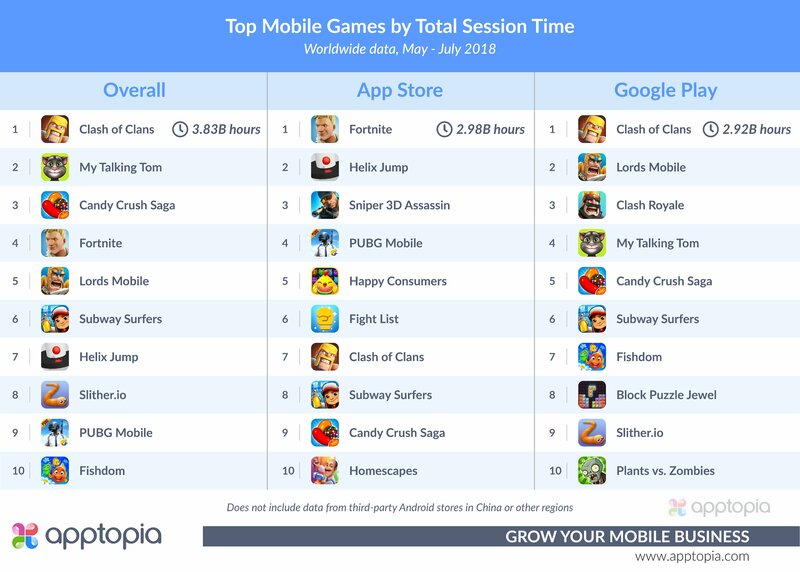 In place of Clash of Clans at the top on iOS, Fortnite reigns, and its 2.98 billion hours of session time earn it a 4th place spot on the overall rankings. But with Epic Games using its own launcher for Fortnite on Android, however, future data to show how much the game's launch on the platform pushes it up the overall charts will be difficult to come by.